With Carnival Cruise Line being Miami based, there are always a lot of people from South Florida aboard Carnival ships wherever they go in the world. That includes the new Carnival Breeze, which is on its second cruise, and last night it was in the Adriatic heading toward Venice for a call today (June 22, 2012). Meanwhile last night in Miami, the Heat was battling the Oklahoma City Thunder for the NBA championship in what was to be the final game of the series. Time and distance though were no obstacles for Heat fans, including the ones currently sailing aboard Carnival Breeze. 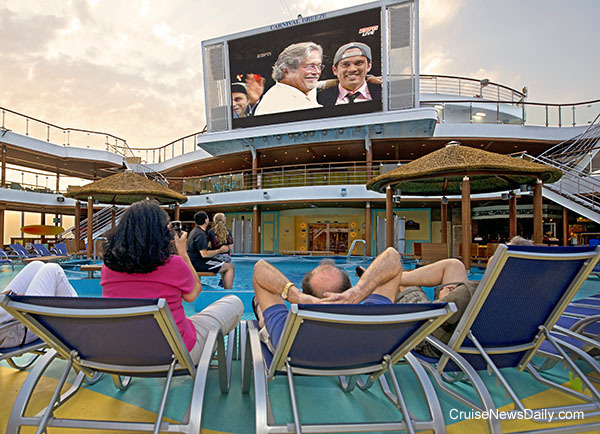 Because of the time difference, the 9pm Miami tipoff meant it would be 3am aboard Carnival Breeze, and there were fans ready to watch the game live on Carnival Breeze's giant poolside screen. (We assume there were also some less hardy fans who watched from the privacy of their staterooms.) They saw the Heat win the title just after 6am this morning with a glorious Venetian sunrise as a backdrop. They can be seen here watching the post-game celebration about 6:30 this morning, with Carnival Chairman Micky Arison - and Miami Heat owner - being interviewed along with Heat Coach Erik Spoelstra (right) as part of the ABC/ESPN coverage broadcast live to the ship. Celebrity Cruise Line executives give a video update on the construction of Celebrity Reflection at Meyer Werft and discuss the necessity of adding some new features on Reflection since it is a bit different design from the rest of the Solstice-class and a number of new features were added to Silhouette. Of course Celebrity is also thinking beyond Celebrity Reflection, because Lisa Lutoff-Perlo, Celebrity's SVP of Hotel Operations, says, "A lot of the things we've done on Reflection give us a nice springboard for the future as well." What is exciting people most about Royal Princess? The new Royal Princess will be reality in just a year. It's going to be loaded with new features and improvements on ones we're already familiar with, so Princess' executive vice president of fleet operations, Rai Calouri, wanted to know what people are most excited about. Rai took his video camera around Princess' headquarters and aboard some ships and asked other Princess executives, travel agents and passengers what's the first thing they're going to do when they step aboard the new Royal Princess.